Formula One: Have Ferrari/Red Bull signed up with Ecclestone? Get tuned in to the automotive world like never before. Take your mobile device out for a spin and really open it up with the Autoweek iPad and iPhone apps. Join the hundreds of thousands of auto enthusiasts who have discovered the benefits of Autoweek newsletters and e-mails. Your place for Autoweek wearables, swag and more. Great gift ideas for the car lovers and auto enthusiasts in your life. See bonus content. Share your opinions, photos, story ideas and tips. We want to hear from you! Get to know the personalities behind the bylines. Give them feedback, ask questions or just say hello. The RX-8, shown, and the RX-7 that preceded it are largely responsible for Mazda's fun-to-drive reputation. Mazda Motor Corp. has canceled production of its RX-8 rotary engine sports car, citing falling sales and stringent global emissions standards. Production in Hiroshima, Japan, ended in early July and global sales of the car will conclude later this year. The RX-8 and the three generations of the RX-7 that preceded it have long been the foundation the brand's fun-to-drive aura. The car's high-revving 1.3-liter, twin-rotor rotary engine produces 232 hp at 8,500 rpm--a big punch in a relatively small package. But Mazda sold just 1,134 RX-8s last year, a 49 percent decline from 2009. Sales through July this year were down another 21 percent. The RX-8, which has a base price of $27,590, including shipping, peaked at 23,690 sales in 2004. But the first-generation RX-7 surpassed 50,000 units throughout the early 1980s. Mazda's U.S. dealers had 300 units in stock as of Aug. 1 for a 118-day supply, according to the Automotive News Data Center. Mazda pulled the RX-8 from the European market last year after the car failed to meet local emissions standards. Without volume from Europe, Mazda couldn't justify selling the RX-8, a Mazda source said. Exporting vehicles from Japan also has become more difficult. The yen's rise vs. the dollar was a major reason why Mazda's North American operating losses from April through June grew nearly threefold to ¥7.9 billion, or about $97.6 million, from the same quarter last year. This isn't the first time that Mazda has dropped its rotary engine sports car from the U.S. lineup. The RX-7 was pulled after the 1995 model year. A rotary-powered car didn't return to American showrooms until the 2003 introduction of the RX-8. 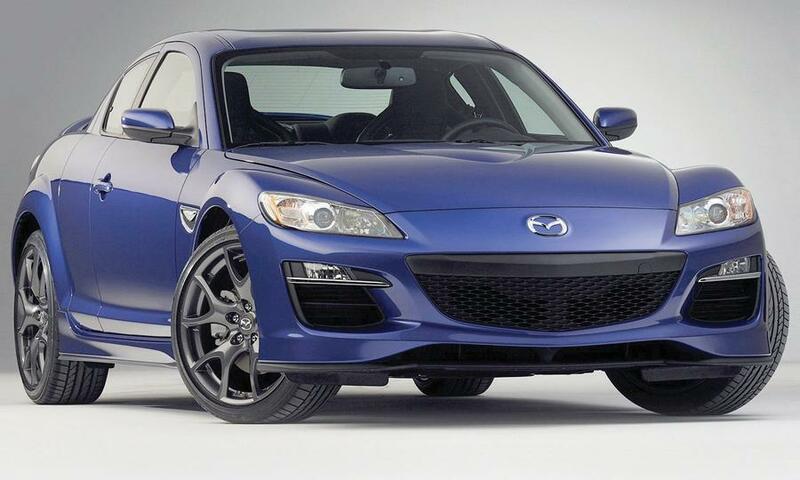 And the RX-8's demise may not be the end of the rotary engine at Mazda. A source says engineers in Hiroshima are still working on the next generation, 1.6-liter rotary engine, code-named 16X, that is said to have lower emissions, better fuel economy and more power. When unveiled at the 2007 Tokyo Motor Show, the 16X had an enlarged elliptical shape for the combustion chamber and an enlarged eccentric center stroke in the rotor. Mazda also planned direct-injection fuel delivery in a rotary engine for the first time. But the 16X project has been on the back burner since the financial crisis. The company chose to focus its r&d; resources on its fuel-saving SkyActiv technologies that debut later this year. Still, Jim O'Sullivan, CEO of Mazda North American Operations, said "the rotary is alive and well within Mazda." While declining to comment on the progress of the 16X, O'Sullivan said: "We are studying what's the best way to come back to the market with the rotary." Get more car news, reviews and opinion every day: Sign up to have the Autoweek Daily Drive delivered right to your inbox. The comments system isn’t loading. Possible reasons include corporate security settings in your workplace, or an failure in the system outside of autoweek.com. To leave a comment, try again soon; or try using a different web browser, computer or device. PCH, Personal Dien Bien Phu Edition: Citroën Traction-Avant or Peugeot 504 convertible? With Chevrolet celebrating its 100th anniversary, which is your favorite? @pconstantine Thanks for the RT! @meCatarina Thanks for the RT! RT @MVaughnAW: @codaautomotive delivered its 1st car to a customer today. The 5-seat battery electric has claimed range of 125 mi. @AMScarborough Thx for the feedback. Good luck in your career! All Content © 2011 Crain Communications, Inc.